Seven people were killed and around 20 others were injured in a grenade attack on a peace concert and reprisal violence in Central African Republic’s capital, Bangui, on Saturday and Sunday, government officials and city residents said. The riverside city has in the past been a flashpoint for inter-religious violence that erupted between Muslims and Christians in 2013 and has since engulfed most of the impoverished, landlocked nation. Interior Minister Henri Wanzet Linguissara said two individuals on a motorcycle approached revelers attending a concert organized to foster reconciliation and social cohesion late on Saturday night and threw a grenade into the crowd. “Following this heinous act, we have registered four deaths and 20 wounded, including four who are in serious condition and have been taken into the operating room,” he said. 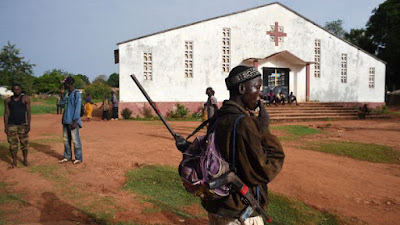 Heavy gunfire concentrated in and around Bangui’s PK5 neighborhood -- a Muslim enclave in the majority Christian city -- erupted after the attack. Access to PK5 was blocked off by improvised barricades on Sunday, a Reuters witness said. A second PK5 resident and a security source, who asked not to be named, confirmed that three motorcycle taxi drivers were killed in retaliation for the concert attack. Nearly five years into the conflict in CAR, which has been marked by successive waves of ethnic cleansing, the security situation is worsening, particularly in the east.